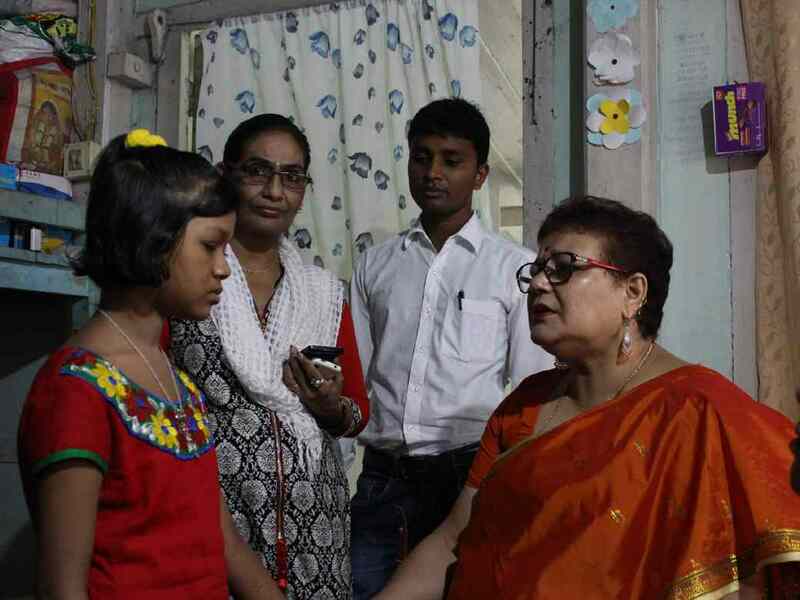 The ASCPCR Chairperson, Dr. Sunita Changkakati, accompanied by Technical Consultant Mr. Maharishi Goswami visited the Chapar Area of Hatipota in Golakganj area of Dhubri district in July, 2017. 1)	To observe the status of child care institutes in the districts to examine and review the services and the implementation of the provisions as mentioned in appropriate Acts. 2)	To conduct review meetings with the line departments to examine and review the status of implementation of the schemes and programmes pertaining to child protection and development. The Commission observed that the local branch of ‘All Muslim Students Union (AMSU) arranges free coaching classes for the students of class IX and X there. Students from various schools were found to be attending the coaching classes. Campus of the school was clean and toilets ok. But an Anti-tobacco campaign was necessary in the campus. The rooms were found to be in extremely bad and unhygienic condition. No toilets were seen and no full time staff was available. This was followed by a Community Meeting at Green Valley Society (NGO) attended by about sixty people. The issues discussed were child labour, child marriage, poor health condition of the children due to lack of awareness, requirement of more Anganwadi centers, unhygienic cooking system of mid-day meals in the schools leading to illness in children, lack of incentives for ASHA workers, forcing them to abandon their duties. A Visit to Aljamiatus Saliha-wal Yatama revealed that no girls were there. The Secretary informed they are home for Idd. The registers were not maintained properly and the Orphanage was not been registered under JJ Act, 2015. The place did not have enough space to accommodate one hundred girls staying there. Girls were made to sleep on floors. Also, no beds were seen in the dormitories. There was no dining space and the girls were kept locked as no female caretaker was there and no facility for indoor and outdoor sports/activities. No formal education for the girls, any female teachers and lack of proper toilets. Then a visit to Darul Yatama was made. The authorities had taken good steps to build infrastructure of the orphanage. Toilets were found in good condition. But it was observed that the children are made to sleep in cramped spaces with insufficient lighting and some children even have to sleep in a corner without fan. More than fifty per cent of the children are made to sleep on the floor. It was doubtful whether the children are provided mainstream syllabus prescribed by SSA? In Saaya Children Home it was observed that despite financial constraints, the authorities were providing education, vocational and recreation facilities to the children. Cleanliness and discipline was seen. The major problem faced by the children home is that it runs on a rented house which they have to vacate in the next few months. Visit to NEVARD SAA was done and it was seen, the Adoption agency is situated in a very clumsy and gloomy environment. The rooms were unhygienic and were not fit for newborn babies and children. It was found from the register that only ten children have been bought to the agency since 2012 till date. Adding to yet another successful intervention of the ASCPCR, the Aljamiatus Saliha-wal Yatama has been asked to shut down by the district administration after the ASCPCR informed about the pitiful condition of the place and the violations seen regarding JJ Act.